Relax and rejuvenate in privacy in the one bedroom apartment on the second floor of our Victorian Gothic updated to please. Perfect for a couple or small families. This historic Painted Lady circa 1879 retains her gracious room and window proportions to catch ocean breezes. The first floor is never rented on this over-sized lot with award-winning flower beds providing beauty in spring, summer and fall. Enjoy the outdoor dining area and gas grill. Read a great book on the traditional open veranda with real wicker furniture. Experience the ambiance of the Victorian era with vintage furniture and room details. The master bedroom has four tall windows for ocean breezes, a traditional dresser, and dressing table. The sitting room has a new lounge sofa, a comfortable armchair, television, and dvd/vcr and two windows. The kitchen is a large eat-in kitchen with three tall windows that catch the cross breezes. Enjoy the Victorian bathroom with a large claw foot tub for delightful soaking. And for those who like showers, there is an enclosed outdoor shower with hot and cold water. The upstairs rental unit has a separate entrance. Centrally located at the Point, simply walk a block to the General Store, US Post Office, or a beach entrance. There is a guarded beach at the foot of the street. And bring your bikes if you like. We'll show you where to store them. Our family is only the fourth owner of our 140 year old Painted Lady. We pride ourselves in keeping this Victorian Gothic summer cottage true to her classic self. We enjoy the seaside pleasures of walking to a beautiful guarded beach, seeing the lighthouse, enjoying the water, & watching the dolphins frolic. Fresh seafood is nearby in Cape May and so are many fresh fruit and vegetable stands. Culture and entertainment are two miles down Sunset Blvd. in Cape May. Atlantic City casinos are about 40 minutes north. We enjoy the peacefulness of the Point compared to Cape May. Walking on the quiet beaches at sunset, biking or relaxing with a good book on the porch and enjoying the bounty of seafood and fresh produce makes for an rejuvenating experience. Recently renovated bathroom in traditional Victorian style with handheld shower and original clawfoot bathtub. There is also a spacious outdoor shower. Walk dogs, fly kites, or go fishing at Cape May Point beaches or at the State Park near the lighthouse. Cape May Point is a prime bird watching location. Small quaint town. Walk to the general store to pick up a few items or enjoy the great food. Participate in family games at Pavilion Circle. Have a pancake breakfast at the fire house. Enjoy the sand and waves at the bottom of our street in less than 5 minutes. 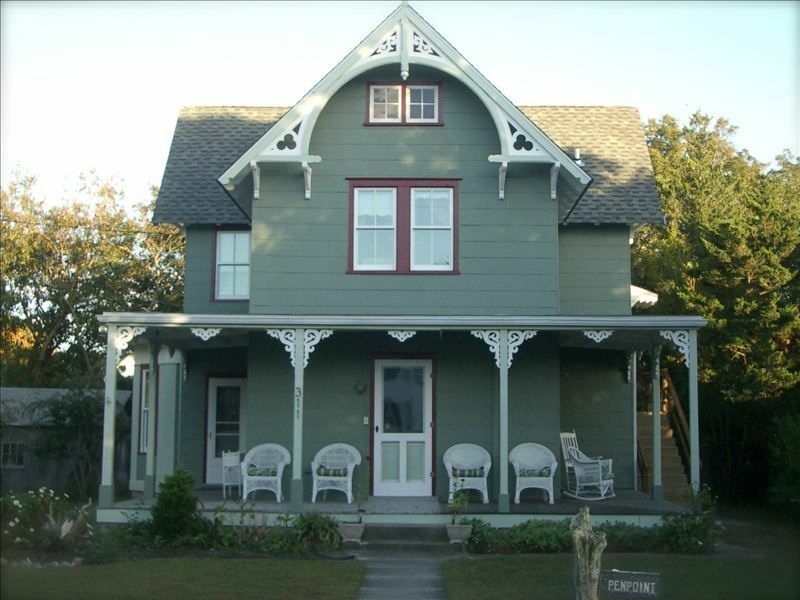 Sit on the porch of this Victorian cottage and enjoy ocean breezes. Three window air conditioner units, one in each of master bedroom, sitting room, and kitchen. Please note there is NO heat so the apartment is not suitable for rentals before late Spring or after early Fall. Please note, NO bed and bath linens are provided. Bring your own linens and paper supplies. The bed in the bedroom is queen-sized. Street parking for two cars available. Internet service is provided via WiFi. WiFi access information is available in the apartment. Please note, NO bed and bath linens are provided. Bring your own linens and paper supplies. Sitting room with armchairs, flat-screen television, and sleeper sofa. A full set of pots and other cooking implements are provided. A full set of dishes and utensils provided. Table with chairs for 4 in kitchen. Outdoor dining for 6 in back yard. Basic television service is available through Comcast. Premium services are available through Apple TV. There is a combination VHS-DVD player connected to the television. Assorted mystery and historical novels of recent vintage. Feel free to take what's there or leave some of your own. DVDs and VHS tapes are in drawer under the television. Expansive lawn with award winning flower beds, gas grill, and outdoor dining. Narrow side balcony with cafe table for two. NO bicycles are provided. Guests may bring bicycles and store them under the outdoor staircase. Although Cape May Point is very safe, please bring locks and chains for your bicycles. Traditional Victorian wrap-around porch with wicker furniture. Small porch with cafe table and 2 chairs on the landing at the entrance to the second-floor apartment. Traditional wrap-around open porch with wicker furniture, street parking, outdoor private hot shower, classic claw foot tub in updated Victorian bath, new double-hung windows true to originals, outdoor clothesline, award-winning flower beds, over-sized lot, reading materials (including classics, mysteries, history of the Point, and birding books), outdoor dining area, a block from General Store and the US Post Office, walk to lighthouse, two beach tags, one block to beach entrance and two blocks to guarded beach. Cape may Point is one of the last beach communities without commercialism. There are three businesses; Audubon Society Store, Red Store Cafe and the man that sells ice cream on the beach. There was nothing else we needed except our bikes. The apartment had the comfort and ambiance of my grandmother's home. Outdoor shower, windows and doors with screens allowed you to remember that you're at the beach. Quaint, modest, and exactly as advertised. The cleanest place I ever ever stayed in. Short walk to the beach, and very close to the State Park. Comfy bed. Kitchen very well equipped. Reliable wi-fi. Wonderful place. Would like to go back for a month next time. We have kept going back to PenPoint from time to time for the last 20 years. There were many improvements made since our previous stay, which made our stay even more agreeable. We love the small walk to the beach to watch the sun set. The top floor apartment was nice, and very close to the beach, about 50 yards from the beach entrance. The town of CMP is very quiet compared to Cape May. We're adding photos of the beach entrance at end of Cape Ave. so future renters can see how close Penn Point is to the ocean. Birdwatchers paradise. Local wineries, fresh seafood, fruit and veggie stands, Cape May Bird Observatory, Atlantic City Casinos. Rentals are from Saturday, 4:00 pm until following Saturday, 11:00 am.